This is going to be one of those rambling blog posts where I start by describing an experience I've had which nobody but myself could possibly care about, and end by making statements about life, the universe and everything that ... nobody but myself could possibly care about. So if you came here while hopping around the internet looking for bright shiny things: this is not one of them. The experience I want to tell you about has to do with a quandary I have often pondered: why I can't stand to read novels written since the early 1900s. Yes, it's about that again. If you are interested in reading, and what goes on when we read (okay, when I read), read on. As our story begins, I was getting close to the end of Dickens. I had only three novels left to read: The Pickwick Papers (not a real novel), The Mystery of Edwin Drood (only part of a novel), and A Tale of Two Cities (read as a teenager and dimly remembered). I always reach a point in my reading of any novelist where I try to draw out the last few books to prolong the experience, and I had reached the drawing-out point for Dickens. So I went to my bookshelves and began scanning for anything fictional I hadn't already read. I came across a book I had been given (all right all right! lent) by a co-worker a dozen years ago. I knew exactly why I hadn't read it: it was written in 1969. Nearly every time I've tried reading something written recently the attempt has been a disaster and I've gone running back the the "classics" where I apparently belong. But my Dickens needed thinning, so I pulled the book off the shelf and carried it into the bathtub. The book I took off the shelf was Doris Lessing's The Four-Gated City. As I expected, it explored fascinating topics, raised persuasive points, developed compelling plots. As I expected, I couldn't stand reading it. The month dragged on. My baths got shorter and shorter. In the tub, I found myself holding the book and pretending to read it while my thoughts were actually wandering far away. I even found myself avoiding the bath entirely by making randomly generated excuses (the enormity of this aberration is difficult to express). The fact was, reading The Four-Gated City felt like stuffing tissue paper into my mouth and trying to chew it. Nevertheless, I dragged myself through the entire book. The post-apocalyptic bit at the end was disappointingly brief, but even that part, though intellectually interesting, was physically unpleasant, even painful. Normally after I finish a good book I enter into what I call a "refractory period" of a few days where I take a break from reading to respectfully reflect on the wonderful ideas bouncing through my mind. After this book I didn't have a refactory period: I had a recovery period. He walked up hill in the mire by the side of the mail, as the rest of the passengers did; not because they had the least relish for walking exercise, under the circumstances, but because the hill, and the harness, and the mud, and the mail, were all so heavy, that the horses had three times already come to a stop, besides once drawing the coach across the road, with the mutinous intent of taking it back to Blackheath. Reins and whip and coachman and guard, however, in combination, had read that article of war which forbade a purpose otherwise strongly in favour of the argument, that some brute animals are endued with Reason; and the team had capitulated and returned to their duty. I tell you, people, I nearly burst into tears. I found myself hugging the book (briefly: wet). I was overcome with joy and gratitude. After a month of famine I found a feasting table set before me: succulent meat, thick deep gravy, vibrant vegetables, lush fruits, strong wine. Why, if these novels were both so well respected, did one leave me feeling as if I was in prison, while the other freed me with joy? Were these both not stories? Were these both not good stories? The little narrow, crooked town of Dover hid itself away from the beach, and ran its head into the chalk cliffs, like a marine ostrich. The beach was a desert of heaps of sea and stones tumbling wildly about, and the sea did what it liked, and what it liked was destruction. It thundered at the town, and thundered at the cliffs, and brought the coast down, madly. The air among the houses was of so strong a piscatory flavour that one might have supposed sick fish went up to be dipped in it, as sick people went down to be dipped in the sea. All of a sudden it dawned on me. The difference was in the metaphors. 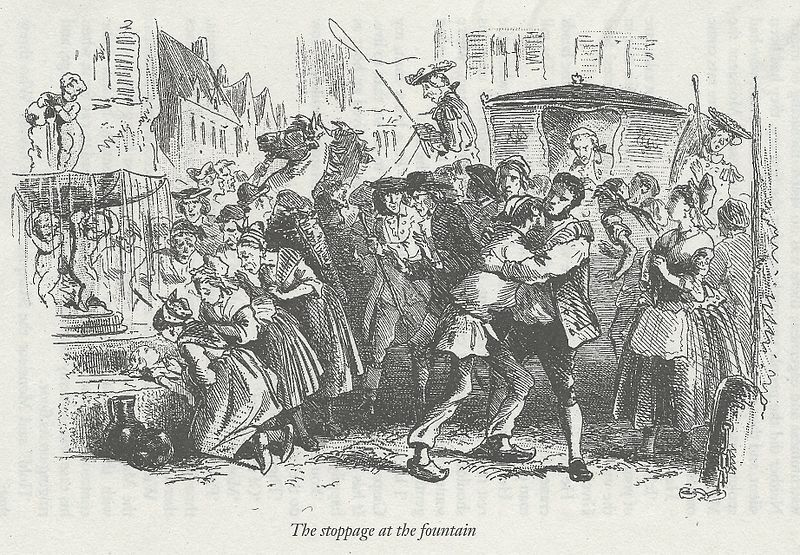 Dickens' work, and the work of many authors of his time, is pumped full of metaphors. The Four-Gated City, and nearly every other recent work, has far fewer. After this thought about metaphors I re-read the passage about Dover while watching myself again. I noticed that I was doing what the words were doing. I ran my head into a chalk cliff and felt the white chalk rub off on my face. I tumbled wildly about, becoming the beach, the stones, the sea. I thundered at the town; I felt the thunder impact my house fronts and cliff faces. I dipped myself from the land into the sea and from the sea into the land. This was exactly what I had stopped doing while I was reading The Four-Gated City. With one book I was running around doing what it said, and with the other I was just ... reading it. Margaret was almost smiling: she was humouring Martha. Who now stood up, confronting Margaret. Who stood up, ready to leave. The women were furious with each other. When I read that the women "were furious with each other" I threw the book out of the bathtub in frustration. This was similar to my "Philip was sad" book-throwing event while reading The Pillars of the Earth (which I wrote about here a while back). In both cases I felt immobilized, disabled, like a dog tied to a stake with nothing to do but gnaw its own feet. This, particularly, was the room, which had become, in the last six months, her home. The moment of greatest pleasure in every day was waking in it, beneath the window, which framed the tree whose leaves she had seen stand in solid leaf, then thin, then fall. It was a sycamore tree. That sycamore tree reappeared several times throughout the book. That sycamore tree haunted me. I could not do anything with that sycamore tree. I could not touch it or climb it or become it. It was tantalizingly close, yet frustratingly unreachable. There, lying in the bathtub hugging Dickens and remembering Lessing, I felt I was finally starting to get an inkling of an answer to my decades-old why-these-books question. Maybe I need metaphor-rich writing because metaphors give me something to do when I read. Maybe reading Dickens feels euphoric because the activity of running around while reading feels more ... alive, somehow. Maybe the metaphors are somehow releasing endorphins in my brain, or making it feel more energetic, or ... something that feels good or right or worth doing. Next I did what any reasonable person would do today: I jumped out of the bathtub and rushed to the computer. I typed into Google "metaphors endorphins." But laughter is fundamentally a physical action. That query drew forth a whole slew of articles like this one reporting on recent research done at Emory University in Atlanta (which turns out to be only one part of a much larger research program finding out similar things). Rather than describe the research I'll just quote a bit from the linked ScienceNOW article. The right turn of phrase can activate the brain's sensory centers, a new study suggests. Researchers have found that textural metaphors—phrases such as "soft-hearted"—turn on a part of the brain that's important to the sense of touch. The language-processing parts of volunteers' brains became active regardless of whether the volunteers listened to the literal sentences or the metaphors. But textural metaphors also activated the parietal operculum, a region of the brain involved in feeling different textures through touch. That part of the brain didn't light up when listening to a literal sentence expressing the same meaning as the metaphor. I am generally careful when reading accounts of neurological research. For one thing, this particular study was done on a grand total of seven college students, which is hardly a representative sample of humanity. Still, the fact that this sort of cross-linking could even be possible was exciting, because the idea of other parts of the brain "lighting up" connected perfectly with my feeling of "running around" while reading metaphorically rich texts (and sitting frustratingly still otherwise). One more discovery spoke even more directly to my Dickens-Lessing problem. At the bottom of the first page of Google results for "metaphors sensory" I found a link to an article in the New York Times by Annie Murphy Paul, called "Your Brain on Fiction." That article takes the same metaphor-to-sensation neurological results and connects them to the experience of reading novels -- all novels. The brain, it seems, does not make much of a distinction between reading about an experience and encountering it in real life; in each case, the same neurological regions are stimulated. Keith Oatley, an emeritus professor of cognitive psychology at the University of Toronto (and a published novelist), has proposed that reading produces a vivid simulation of reality, one that “runs on minds of readers just as computer simulations run on computers.” Fiction — with its redolent details, imaginative metaphors and attentive descriptions of people and their actions — offers an especially rich replica. I agree that some fiction produces a vivid simulation of reality, but I'm going to have to disagree that all fiction does this for all people. Not all fiction is thick with metaphor. Only the kinds I like are. For the most part, only older fiction is written in this way. This is the crux of the issue. At this point I bounced out of the computer, excited to think that I might have finally found a reasonable explanation for my extreme difficulty reading fiction written in the 20th and 21st centuries. In the writing of nearly every author from time periods before the last century, the metaphors come fast and thick. To read Dickens or Eliot or Dostoyevsky or Hardy or Gaskell is to move among jostling crowds of metaphors. It was a large, dark room, furnished in a funereal manner with black horsehair, and loaded with heavy dark tables. These had been oiled and oiled, until the two tall candles on the table in the middle of the room were gloomily reflected on every leaf; as if they were buried, in deep graves of black mahogany, and no light to speak of could be expected from them until they were dug out. This is the rented room of a young lady who believes her father to be long dead. The description of the room repeats the same funereal metaphor no fewer than ten times. The effect is like a deeply resounding bell calling out the name of death, death, death. This use of metaphor (which as I said was once too common to mention) goes far beyond simple connection and is better described as complex. Metaphors can even extend their strands across the boundaries between books. If you have read much of Dickens you will remember his demonic personifications of the thick smoggy mists of London, and how they seem to drift malevolently from one book to the next. To test this idea, I went to my bookshelves and started plucking out books I have loved reading and books I have dragged myself painfully through. Some contrasting examples follow. Towards the end of November, during a thaw, at nine o'clock one morning, a train on the Warsaw and Petersburg railway was approaching the latter city at full speed. The morning was so damp and misty that it was only with great difficulty that the day succeeded in breaking; and it was impossible to distinguish anything more than a few yards away from the carriage windows. When I first read this, I remember spending some minutes just holding the idea in my mind that the day might "succeed in breaking" only with great difficulty. I played with that metaphor as a child would with a ball. One True Thing by Anna Quindlen. Excellent book, powerful emotions, strong characters, deep lessons. Very hard to drag myself through. That January, when they delivered the hospital bed, leaving the den in disarray and the living room crowded with furniture, leaving a long scratch in the oak floor of the hallway because they were careless with a metal side rail, she didn't say anything. She just got in and turned on her side so that she was looking out the window, out the window that looked out on our driveway and the side of the house next door. Years after reading that book, the one thing that stands out in my mind is that hospital bed. But I remember it in the same way I remember Lessing's sycamore tree: as something seen from a distance, behind a transparent wall. Something I wanted to touch and explore but could not. The questionable sound of Silas's loom, so unlike the natural cheerful trotting of the winnowing-machine, or the simpler rhythm of the flail, had a half-fearful fascination for the Raveloe boys, who would often leave off their nutting or birds'-nesting to peep in at the window of the stone cottage, counterbalancing a certain awe at the mysterious action of the loom, by a pleasant sense of scornful superiority, drawn from the mockery of its alternating noises, along with the bent, tread-mill attitude of the weaver. The cheerful trotting of the winnowing-machine, the questionable mockery of the loom. Throughout that novel early industrial machine are given characters that make them part of the action, not just scenery. The Pillars of the Earth by Ken Follett. The broad, capable back of the valley stretched powerfully up to the hillside, inviting Tom to leap astride. A stream like a shining rivulet of warm sweat flowed down its back. There, where the valley could support his weight best, he would build his house. Okay, I'm no novelist, we can all see that. But I can go to that sentence. I can leap onto and into that valley. I can feel its strength and safety. That's the kind of reading that feels like reading. Not all the books I pulled off the shelves matched up perfectly with a simplistic pattern of old-rich new-poor. I found a few cases in which my forays into contemporary fiction have gone well. However, all of them were written by people known for their strong use of metaphor. Out of the dimness of the room in which they sat, a white staircase climbed toward the blue-and-white wallpaper of the second floor. Paul D could see just the beginning of the paper; discreet flecks of yellow sprinkled among a blizzard of snowdrops all backed by blue. The luminous white of the railing and steps kept him glancing toward it. Every sense he had told him the air above the stairwell was charmed and very thin. I don't remember viewing that staircase from afar. I remember touching it, walking up and down it, breathing that "thin" air, climbing the wall myself as the staircase. That staircase is part of the story of Beloved (and part of my memory and experience of the story of Beloved) in a way Lessing's sycamore tree and Quindlen's hospital bed and Follett's valley are not. The large, calm room was shadowy and silent, darkening. Shevek looked around it, the perfect double arches of the windows, the faintly gleaming edges of the parquet floor, the strong, dim curve of the stone chimney, the paneled walls, admirable in their proportion. It was a beautiful and humane room. It was a very old room. ... I have been here a long time, the room said to Shevek, and I am still here. What are you doing here? I can do something with this kind of writing. Not only can I see and feel this room, I can speak to it, and I can become it. I can run around holding it. During that interminable night ... Colonel Aureliano Buendia scratched for many hours trying to break the hard shell of his solitude. Can you feel that shell? Looking at this makes me wonder if this is why I enjoy surrealistic writing so much (Borges, Calvino, Kundera, Kafka). If the whole story sits inside a metaphor the experience is even more physical: not just things to run around with, but also to run around in. A question: Do you send yourself messages in song lyrics? Do you ever find yourself singing a song not because you heard it recently but because you are trying to tell yourself something? (Just say you do so we can move on.) The morning after all this happened -- the bath, the chalk in my face, the googling, the frantic book-yanking -- I was making coffee, and I realized I was singing the great Captain and Tennille song "Do That To Me One More Time." At this point in my explorations a burning question entered my mind: Why on earth did Doris Lessing win the Nobel Prize for Literature? This fact can only mean one of two things: (a) I am the only human being who knows what good writing is, or (b) people read in a variety of ways, and some of them are not how I read. The first of these we can discard out of hand. This leaves us with the next question: Why do so many people today, unlike myself, find relatively metaphor-poor fiction readable, even enjoyable -- dare I say it, even preferable? Perhaps there is natural genetic variation in the extent to which reading metaphors activates sensory parts of the brain. The study I mentioned above only included seven people. Probably there is much larger variation to be found in larger samples. Maybe I happen to be on the tail end of the distribution where metaphorical-sensory activation is so strong that reading metaphor-poor writing becomes painful. If this is true, many more people should inhabit the middle of the distribution, and some will be found on the other side, where metaphors are words and nothing more. Maybe to the majority of people, Lessing's sycamore tree is not blocked off because Dickens' tumbling rocks don't tumble. A thing can only be blocked if there is some reason to want to go to it. "I have an ant farm in my head," he says. "Metaphors and ideas crawling all over each other." "I was born a collector of metaphors," he says. "Metaphors are the center of life." By the nurture explanation, what I read defined for me what reading ought to feel like, which defined what I would enjoy reading, which defined what I read. In other words, maybe I "run around" while reading fiction because I have spent so much time doing that. Maybe people who have not spent as much time reading run-around types of fiction don't miss it when it doesn't happen. Where have all the metaphors gone? How would each of these two positions explain the general decrease in metaphorical density between classic and contemporary novels? I don't think it's necessary to prove that there has been a decrease; anybody can find this out for themselves given five minutes in a library. With exceptions, of course, the overall trend has been monotonically downward. The genetic-variation explanation provides the simpler story. By this interpretation, when Dickens wrote novels far fewer people read or wrote than today. Maybe at that time a small subset of writers wrote for a small subset of readers, and they all shared similar cognitive proclivities, because paying attention to prose was self-selecting. It was sort of like the early internet: because it was bare-bones technical, only the technical got involved with it. But today the reading and writing of novels has spread out to encompass the entire spectrum of cognitive styles. People with all ranges of natural tendency to connect metaphor with sensation (or not) are involved in both the reading and the writing. So a book that leaves someone like me trapped in sensory deprivation can still thrive in the marketplace of ideas. If true, this can only be a good thing. In the same way that the internet more closely resembles humanity than it did in its early years, novels today more closely resemble the diversity of human reading styles than they did in their early years. I like this explanation because it does not mean anybody's reading apparatus is broken, yours or mine; it just means we are all different. And we already knew that. The acquired-condition explanation provides its own story of the sea change in metaphorical density. This interpretation points out that the very first novel-length stories were not told by novelists. They were told by bards who kept their stories in their heads. It is reasonable to assume that this faculty depended in part on the use of sensory metaphors as mnemonic devices. So maybe the first novels carried the heavy use of metaphor over from ancient oral traditions. Along the margin of the sea, we slept. On board returning, thresh’d the foamy flood. If metaphors in fiction are a historical remnant, it would make sense that the further we get from orality the less fiction will carry metaphors with it as a matter of necessity. At some point metaphorical density becomes a matter of style, not of utility. This seems to match the variety of forms we see in today's writing. If people vary genetically in how strongly metaphors activate sensory regions of their brains, and if nothing can be done to change this, a certain set of actions and expectations will be called for in the fictional future (all futures are fictional, as are all pasts). The issue will become a matter of deep and abiding respect for metaphorical diversity. To begin with, all locations on the Fictional Metaphoric-Sensory Activation Spectrum (FMSAS) will be treated with respect and equal rights before society. As a start, any official fiction prize award committee, or faculty of a literature or creative writing department, or literature curriculum, will be populated with verifiable, accountable diversity on the FMSAS. Laws will be passed prohibiting discrimination against readers or writers of any persuasion, no matter how many or how few metaphors they prefer. The era of mistaken-yet-well-meant creative-writing advice such as "use metaphors sparingly" will end, though probably only as the prejudiced generations pass away. The mixing of metaphors will most likely continue to be seen as anathema for some time, but even this practice may someday find acceptance in a more enlightened society. Metaphor lovers may someday feel perfectly free to admit their proclivities in public without fear of blame or isolation. Finally, both readers and writers will someday be encouraged not to beat their heads against the walls of their disinclinations but to follow their bliss(es? ), metaphorically speaking. I foresee a world abounding with FMSAS tests, both self-administered and, for the more serious or encumbered with excess cash, fMRI based. People will test their dates; parents will have their children evaluated; workgroups will participate in combined Myers-Briggs-FMSAS workshops to improve collective productivity. The age of respect for metaphorical diversity will arrive in bounteous waves of mutual admiration (or, if you are at the other end of the FMSAS, in bounteous mutual admiration without the waves). On the other hand, if the linking of metaphor with sensory activation is an acquired characteristic dependent on activity, everything can and should and will be done to shape the reading experience so as to expose all citizens to the widest range of metaphorical experience. Someday, no intellectual thinker will be able to hold up their large, brain-filled head if they cannot demonstrate a superior facility at leaping nimbly from one end of the FMSAS to the other, and to all points in between. As we now speak of singers with perfect pitch, someday we will count among our heroes those with perfect metaphorical-sensory activation control. Prize award committees, faculties and curricula will be populated with the activities of these gifted individuals. Training in the understanding and appreciation of literature, and in the writing of creative works, will include extensive exposure to varieties of metaphorical density. Flexibility immersion courses will be popular. In these, participants will be voluntarily confined in successive rooms filled with alternating courses of metaphor-rich and metaphor-free prose. Sophisticated medical devices will record stress levels, and participants will refuse to leave their "spectrum rooms" until they have succeeded in attaining their target equanimity matrices. For those less willing to undergo such rigors, metaphorical density coaches are likely to appear, aiding the stumbling as they advance their neglected skills. There is a role for government in this scenario as well. No opportunity to educate the public in metaphorical flexibility will be ignored. All public signs and announcements will be posted in metaphorical and "plain speaking" forms. Even candidates, parties and referenda on voting ballots will be described both metaphorically ("Should roads be paved by the angels of solitude?") and directly ("Should road crews be composed of at least two members?"). All of this important and necessary work will contribute to the creation of an educated citizenry able to converse in all forms of prose. It must be noted, if reluctantly, that in the first generation of this reform movement, some poor souls whose early years were spent squandering their potential in reading only one style of writing will need the help of a safety net. We can expect them to rely on remedial aid in the form of government vouchers for private counseling. Sadly, we suspect that few scholars will be willing to help these people, since the early damage to their potential flexibility may be irreparable (though everyone will be at pains to avoid stating the obvious). It goes without saying that those quixotic individuals who do attempt to help the metaphorically inflexible will be ridiculed as windmill-tilters (though their pupils may or may not follow the allusion). However, leaving the relatively few misfits aside, the greater population in years to come will experience heights of reading enjoyment new to literary history. Never again will any middle-aged woman lie in her bathtub suffering at the hands of an award-winning yet frustratingly unreadable book. No, no. All books will be readable! All readers will be capable! In short, every free human being will enjoy every book ever written and ever to be written. This is the future we can foresee. This is the future we can create. Or, the situation may have arisen from a combination of nature and nurture intertwined and inseparable. In which case we should just ignore the whole thing and go about our business. So we just got back from a family car trip. At a rest stop on the way I picked up a cute little brochure called "Born To Be Wild: The Guide to Getting Kids Outdoors." I like to see what people are saying about nature, so I picked one up. The brochure is formatted like a magazine issue, with its large title and some article-headline sub-titles below. Let's start with the main title: The Guide to Getting Kids Outdoors. What is wrapped around that message? That kids don't want to go outdoors, of course. Because if they did, would parents have to "get" them there? What if the brochure was called The Guide to Getting Kids to Love Candy? Or The Guide to Getting Kids to Stay Up Past Their Bedtimes? Names of things rely on shared expectations of values like what is easy or hard, normal or abnormal, right or wrong. So if a brochure claims to explain how to "get" kids out in nature, its "extra" meaning, intentionally or not, is that kids have to be "got" into nature and will not "go" there readily or on their own. Diversion: I wish I could talk to the people who came up with all the "Reading is fun!" campaigns. Can you think of a slogan less likely to make kids want to read? You know what "reading is fun" means to any sane kid, right? That reading is not fun. That it is so very not-fun that adults feel they have to trick it up with exclamation marks and candy colors. Do parents think children can't see the titles that say "Ten Ways To Make Reading Fun For Your Kids?" Do parents think children can't understand what that means? If you want to convince somebody of something, pay attention to all the layers of meaning, not just the ones with the words in them. Back to the helpful nature brochure. Now let me describe each sub-title on the cover of the brochure and the extra message wrapped around it. At this point I'm feeling pretty insulted, patronized and irritated by the "advice" in this brochure. Most of what could be seen as information is just everyday common sense. Bigger tents have more room in them than smaller tents. Two stove burners are better than one. People get wet in the rain. You need soap to wash your hands. Kids need more adult help before age eight than after. When a kid rides a bike, their legs need to be long enough to reach the pedals. And this gem: "The sea is nothing to be trifled with." I begin to wonder who produced this thing and how they thought it could possibly be helpful. Angstrom pack. A fastpacking favorite. This hydration-compatible 30-liter pack features a zip rain cover to keep your gear dry during all-day treks when it's pouring. You don't know what any of those words mean, do you? Look, you'd better just buy this, quick, and let us render you capable of camping. Otherwise, truly, speaking as an expert here, you have no hope. You do realize you will be walking through pouring rain for whole days at a time, don't you? You didn't know that? Oh boy. You really need this. As a dutiful parent, I must drag them through it anyway for their own good. Being in nature with children is overwhelmingly difficult. I can't possibly do it on my own. I desperately need help pulling off this required but horrible parental duty. Who can help me? Oh! These nice people with these magically helpful supplies! Scientific supplies! Angstrom supplies! What saviors! Do I think this advertising campaign is evil for placing this mostly-fake-advice brochure in highway rest stops where unsuspecting parents will think it comes from a park service? No (okay, mostly no). Do I think the major outdoor equipment retailer is evil for doing this? Not especially. The "you are lost without us" ploy is as old as the hills, and if one group is doing it so are many others. Do I think consumers need to pay close attention to messages wrapped around messages, and stories wrapped around stories, in the "helpful" information we find placed around our world? Yes. Here is a little pestering idea you might want to be pestered by. I started this blog to pass on pestering ideas, so there you go, little idea, move along. When Google first got exciting, it was because it was more accurate than anything else out there. It was more accurate because it relied on the web of meaningful links people had put in place, for their own individual and group purposes, by hand, without using Google. I don't remember the details, and probably you don't either, but somehow Google made use of the fact that on a web site about turtles there were links to other web sites about turtles, so when you searched on turtles it could use those links to rank results with turtle-related words in them. Essentially, the reason Google was so reliable was that we didn't rely on it. Have you noticed lately how, more and more, people say on their blogs or web sites or whatever, I'm not going to bother to link to that, just google it? Have you noticed the results of searches on google getting worse? Maybe the more we rely on it the less reliable it becomes. Google helps those who help themselves? A few curious things I have been playing with, things you might also find interesting. All in the category of change. Don't rub too hard! Let the board do the work. Let that bounce around in your mind for a while. It was within an hour of midnight. The weather being dark, and piercing cold, he had no great temptation to loiter. The sharp wind that scoured the streets, seemed to have cleared them of passengers, as of dust and mud, for few people were abroad, and they were to all appearance hastening fast home. 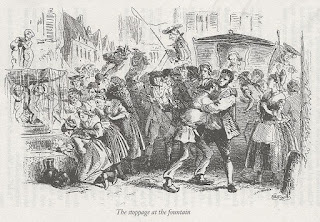 Presently, the coach came; and, after many sorrowful farewells, and a great deal of running backwards and forwards across the pavement on the part of Miss La Creevy, in the course of which the yellow turban came into violent contact with sundry foot-passengers, it (that is to say the coach, not the turban) went away again, with the two ladies and their luggage inside; and Newman, despite all Mrs Nickleby's assurances that it would be his death--on the box beside the driver. My guess is that in Dickens' time the separation between conveying oneself (passenger as passer-by) and being conveyed (passenger as cargo) was just beginning to be required. The online etymology dictionary says the conveyance meaning ("one traveling in a vehicle or vessel") was "attested" (in use?) as early as the 1500s. But certainly Dickens must not have felt it was confusing to his readers to use the term to mean people walking by as late as the mid-1800s. In our time nobody would ever refer to someone walking as a passenger, or even as a foot-passenger. It would simply make no sense. The word now means being fully conveyed. A free online dictionary describes a passenger as "a traveler riding in a vehicle (a boat or bus or car or plane or train etc) who is not operating it." Apparently there is also a slang use of the word as "a member of a group or team who is a burden on the others through not participating fully in the work." If something has gone all the way into metaphor, it's pretty firmly situated in its meaning; it has to be for the metaphor to work. What does it mean that we now see ourselves as not moving but moved? I don't know, but it must mean something. We have recently been watching The Andy Griffith Show on Netflix. It is simply fascinating. The other day we saw an episode about privacy and information, called "Stranger in Town" (Season 1 Episode 12), that anybody who is interested in society in the age of the internet will want to watch. It sets all sorts of mental gears turning. I'll give you a brief synopsis. A man shows up in Mayberry, Ed Sawyer. He is a complete stranger, but he knows many details about everyone in town: names, habits, quirks. The townspeople respond with some distrust and fear, though they are mostly too mystified to know how to react. Is he a spy? An alien? A Hollywood agent? A long-lost relative? Someone with a loose screw? In the end, as usual, Andy the sheriff calms everyone down and finds out the innocent cause of the mystery. Turns out Ed heard all about Mayberry from an Army buddy of his who was born there. When he left the Army he found he liked the place so much that he renewed his buddy's subscription to the local newspaper. That's how he knew about everybody and everything. Once Andy explains the situation everyone welcomes the nice, if over-eager, man to the town, and he settles in. What I found amazing about this episode was how I felt watching it. You might think that in this day and age I would find Ed Sawyer's ability to find out a paltry amount of information about people quaint and pleasant. Surprisingly, I felt more alarmed at the state of affairs (in the first part of the show) than the townspeople did! At one point Opie (Andy's 5-year-old son) ran out of the sheriff's office onto the sidewalk, and I had a strong emotional reaction: Don't let Opie go out alone with a stalker like that hanging around! The whole thing was almost like a twilight-zone episode, it felt so creepy. It felt even creepier that Andy (the law) was so accepting of the stalker. Evidently in the 60s such a plot was seen as television-cute (as all of the other Mayberry plots have been so far). It does not seem so now. My guess is that because we all know how people can find out lots about each other, we can link it more strongly and obviously to intent: negative intent, nasty intent. And apparent evidence of negative intent is more alarming than any mystery. That's how I felt, anyway, watching it. I'm curious to know how other people watching that show today would feel. If you watch it, or have watched it, tell me how it seemed to you.